22 year old Venkatesh Potluri, born with congenital glaucoma, first came to LVPEI’s Dr PRK Prasad Centre for Rehabilitation of Blind & Visually Impaired at the age of two. Though his vision is limited to light perception, he has completed his MS by Research following his BTech (Hons) from the International Institute of Information Technology, Hyderabad. What is inspiring and share-worthy about his story is that he achieved his academic accolades through audio rendering of text books as he was born blind; a great deal of grit, determination, parental support and dedicated professional efforts by the rehabilitation team going to make it all possible. He now feels buoyed and confident enough to pursue a PhD too! Thanks to his own spirit of persistence in realizing his goals, Venkatesh has also successfully explored his creative potential. 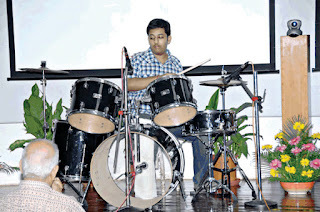 Popularly known as the “drummer boy” for his remarkable skills at the drums, Venkatesh has notched up impressive performances with Hyderabad based rock bands, and even shared stage with the musical maestro A R Rehman as his group member.